I started writing this book in an effort to be as accurate as possible regarding the clans, their septs, and spelling variations. As a convener for my clan, it has been frustrating to rely on books written to sell tartan or to be all inclusive. 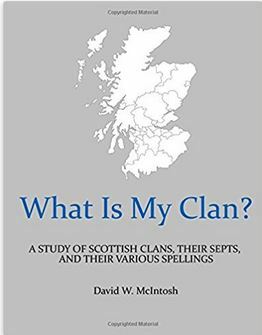 This book has been written to identify the septs and spelling variations for Scottish clans. It is not intended to be a guide for tartans. I have written this book after talking to as many Chiefs in Scotland as I could reach. If the chiefs were unavailable, I relied on the Scotland-based websites for the clans. For clans without a Scotland-based site, I relied on other UK websites. As a last resort, I contacted US based Societies or their leadership. Some names have been removed from the various lists in the effort to be accurate. There are many clan/house groups, both Highland and Lowland, that have a differing list of names between the Scotland Chiefs or Societies and the US Societies. In some cases, US Clans or Houses may not be happy with the lists of their septs and spelling variations. Many US Societies have added more names to bolster membership and to be all inclusive. This book does not include the cadet clans and their septs as part of the parent clan. Cadet clans were those that were started by a second son. In the case of these clans, they are listed as their own entity, septs and spellings. It should be noted that many Highland Clans were known to have both spelling variations and septs. Lowland Houses, on the other hand, only had spelling variations-despite what may be argued. Also, for a clan that has a Gaelic name and an English name, both were shown with their spellings. Clan (House) Hay is a notable exception, where they are a clan of five joined houses that have several septs. Most Lowland family groups were known as Houses, as well as Highland groups not of Gaelic descent. More recently, some have started to refer to themselves as Clans. There is also conjecture as to if there were ever really any septs for clans at all. Some historians believe that septs were a byproduct of the Victorian Age. However, some family names have been associated with a clan well before that Age. It is my hope that this book will help other conveners be as accurate as they can be in their duties to their clans.